Amy Lashley is an Atlanta-based artist who writes and performs original material and, with influences ranging from traditional finger-style techniques to more modern and percussive folk, she is fast developing a style of her own. Her lyrics, delivered with a soft and seemingly vulnerable voice, are reminiscent of those from a former folk music era. With a high school band director for a father, Amy found herself surrounded by classical music from an early age. Growing up in this environment encouraged her to excel on the trumpet (her first instrument of choice), eventually leading her down a long path toward her current standing as a guitarist and performing songwriter. The disciplines cultivated through her experience as an accomplished classical musician have made it easy for her to apply classical theory and musicianship to her current approach of songwriting. In 2003, after becoming increasingly interested in the world of modern folk music, Amy decided to try her hand at the acoustic guitar. She immediately fell in love with the instrument and, of her newfound passion, says "It's really become an obsession. My day never feels balanced if I don't start it off with a cup of coffee, NPR, and my guitar." Once it was made evident to her that the guitar was a talent she wished to pursue further, the art of songwriting is what came next in her musical progression. Regarding her influences, Amy remarks that "Musicians such as Ani Difranco, Ellis Paul, and Antje Duvekot have all had a huge influence on my music, and I hope it shows." 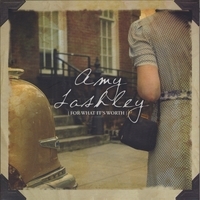 Having recently released her first professionally recorded full length album, "For What It’s Worth," Amy has been touring in support of it throughout the Southeast and Midwest regions. Currently, she frequents the stages of some of Atlanta's premier acoustic venues including Smiths Olde Bar and Kavarna. In the past she has participated in music festivals such as Ladyfest South and the Southern Womyn’s Music Festival (2007). She was also a guitar instructor at the first annual Girls Rock Camp Atlanta in the summer of 2008 and took 3rd place in the Atlanta Southern Voice’s 2008 Female Songwriter of the Year. When it comes to her motivations for being a performing singer-songwriter, Amy professes, "Writing my own music, giving a voice to my feelings... this has helped me to find myself in a very real way. I hope that it will help to do the same for someone else."